New York: Basic Books, 1991. First edition. Octavo, original half cloth. 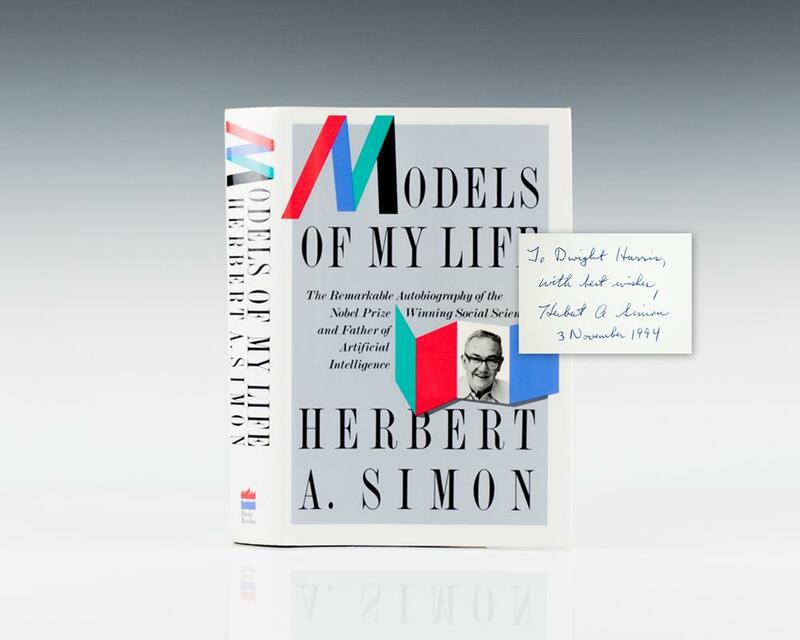 Inscribed by the author on the front free endpaper, “To Dwight Harris with best wishes, Herbert A. Simon 3 November 1994.” Fine in a fine dust jacket. Simon observes himself as an object for scientific inquiry in this refreshingly innovative autobiography. Principal architect of the field of artificial intelligence, this polymath has applied the metaphor of a decision-making maze to human cognition, management science, economics and politics--winning a Nobel Prize in 1978. Instead of a dry, rationalist exercise, this traipse through the branching paths of his personal labyrinth turns out to be a quirky, soul-baring self-analysis. In early chapters on his introspective Milwaukee childhood, he refers to himself in the third person as "the boy." He is equally objective in discussing his 1930s flirtation with political radicalism, his half-century-long marriage and the politics of scientific infighting. This is a disarming self-portrait by a gifted writer who believes that the real self is an illusion and that one's life need not have a unifying thread. Sun and Shadow: The Philosophy of An Architect. New York: Dodd, Mead & Company, 1956. First edition. Quarto, original cloth. Inscribed by the author opposite the title page, “To the Walter Paepcke with best regards, Marcel Breuer.” The recipient, Walter Paepcke was an industrialist and philanthropist most noted for his founding of the Aspen Institute and the Aspen Skiing Company in the early 1950s, both of which helped transform the town of Aspen, Colorado into an international resort destination and popularize the sport of skiing in the United States. Near fine in a very good dust jacket with light rubbing and wear. Books signed and inscribed by Marcel Breuer are scarce. Bush, George W. (John McCain). Decision Points (Signed Limited Edition). New York: Crown Publishers, 2010. Signed limited edition of George W. Bush’s autobiography. Octavo, original cloth, original slipcase, illustrated. Signed by George W. Bush and additionally signed by Senator John McCain, who was the Republican nominee for President in 2008. Fine in a fine slipcase. Blood, Brains & Beer: The Autobiography of David Ogilvy. First edition of Ogilvy’s autobiography. Octavo, original cloth. Boldly signed by David Ogilvy on the title page. Fine in a near fine dust jacket with light wear and closed tears.